The key competitive edge of Air Robot is"idease"it has evolved from the manufacturing industry into the knowledge-base creative industry. Air Robot considers how robots will be used in everyday life and,above all,focuses on researching and developing concrete and marketable robots,and releasing these competitives products into the market. 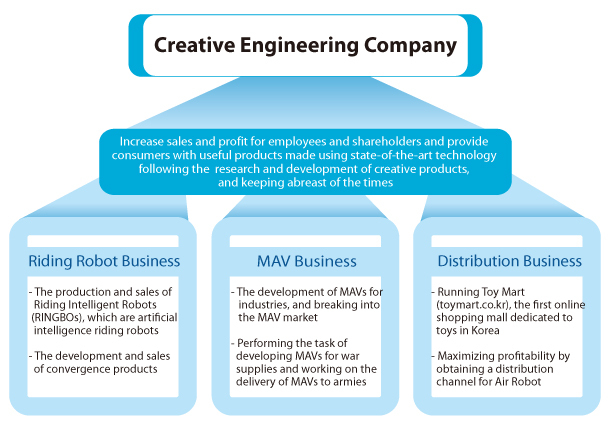 Air Robot will make every effor to respond to change in demand.These efforts include working on the developement of riding robots,MAVs,and high-tech robot toys that can be connected to PCs,and enhancing the value added by integrating toys with advanced digital robot technology. This is the time to pursue the efficency of national investment and to ensure national competitiveness .Air Robots is working on a listinng on KOSDAQ by investing in R&D for a veriety of robot project and expanding sales sources. Air Robot manufacturing useful,advanced products by conceving and implementing new,creative ideas,The company will continue to grow and make every effort to evolve into a creative engineering company that pursues"creative engineering",which is the process of conceiving and implementiing "ideas".